"Why “Bhaja Nitai Gauranga Radhe Shyam Japa Hare Krishna Hare Ram”? You see “Bhaja Nitai Gaur” – “Bhaja” here stands for seva. It stands for the service one is rendering. It´s not a physical service, but it’s a service to the world through vibration. The aim of human life is to attain pure Love, so that you can truly say that you have loved God. 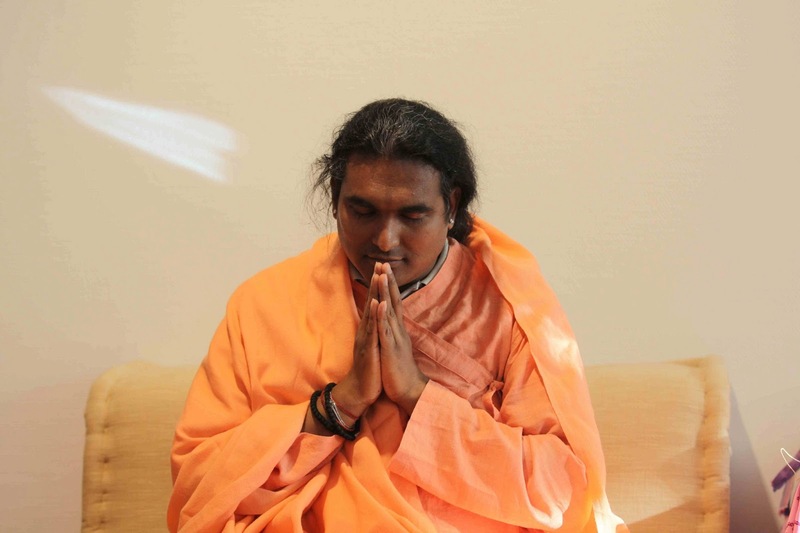 Like I explained in the satsang: there are stages to reach sacred Love - Prem. In this yuga they say always that “by chanting the Divine Name one achieves that level”. So why Gauranga? Gauranga is a combination of RadhaKrishna, so that’s why we are singing “Bhaja Nitai Gaur” – service to Nitai and Gauranga, which is service to RadhaKrishna. At the same time “Japa Hare Krishna Hare Ram” – at the same time you are chanting the mahamantra also. 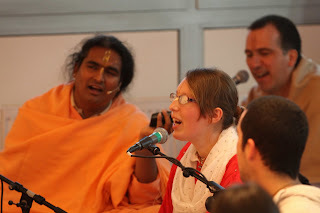 So how you will reach the Love is by chanting and through the Grace of Prabhu Nityananda - and Mahaprabhu can give Himself. Because if Nityananda Prabhu says something Mahaprabhu can´t refuse. It’s the same if Radha says something to Krishna, Krishna can´t refuse. That’s why it is said that Radharani is more wonderful than Krishna Himself. There are three kinds of Love. When we talk about Love, you say “I love you”, always – have you ever written a sms to Krishna, to God, to say “God, I love you and I miss you so much”? No, you never! But to all the people you say “I love you, I love you, I love you”, you know. Imagine how much Love that He has – for you, and yet, you forget about it. You are mostly concerned about human love, relationship all this, which will last only for some time and finish and then you jump again on another thing. Misery, misery, misery, misery, misery, misery – always misery! When your soul's aim is to attain just Love, through service to Him. 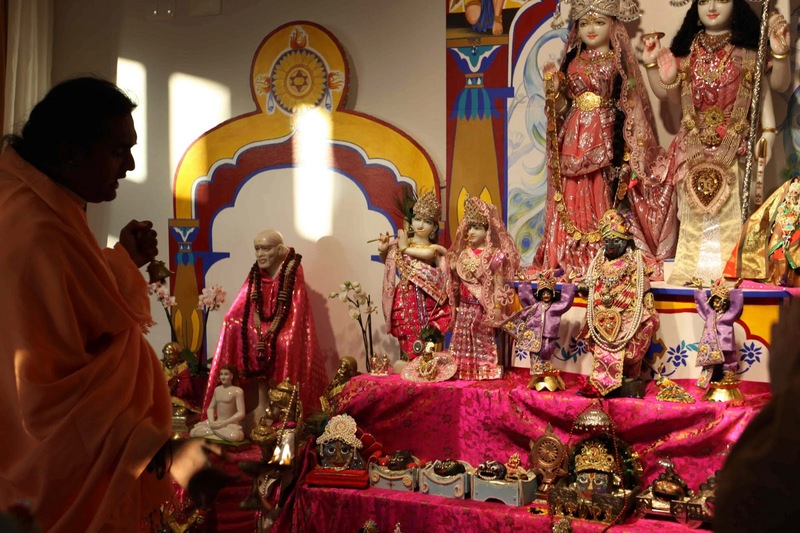 By chanting “Bhaja Nitai Gauranga Radha Shyam Japa Hare Krishna Hare Ram”, these 15 minutes that you give of your time is a great contribution. Because everything is vibration, you know, everything vibrates. 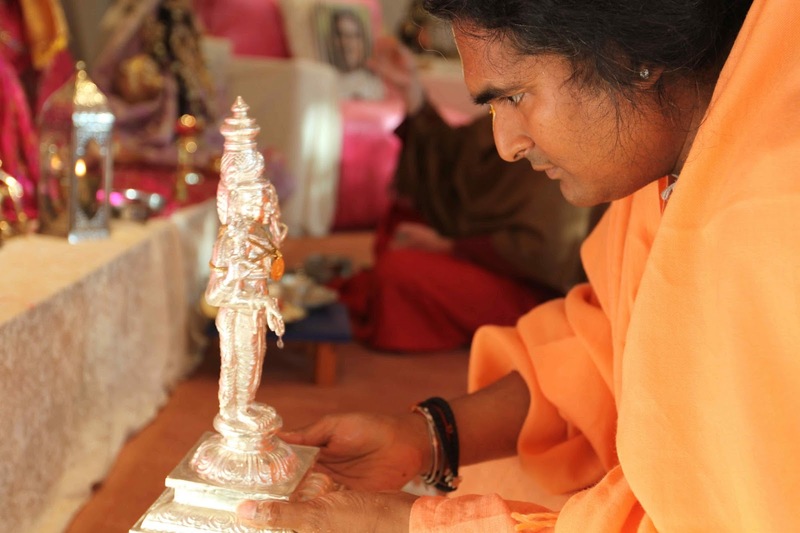 This time, when you concentrate and when you are chanting – He is here. And that´s what the mantra awakes. The knowing, that He is the Lord that governs everything. He is the Lord that governs your heart and He is the Lord of your heart and nobody else. In the Gita, it says “All the names that you chant are mine, all the forms are just inside of me, not out of me. Nothing can exist out of me. Whatever you see…”. You can say “yes, God is there, outside”, but the whole universe is inside of Him. How can you be out of Him? Without Him you would not be here. You can´t exist without Him! So that is what you have to realise: Even if in His cosmic form, He is deep inside everybody, He is in everything, but yet we are all part of His cosmic body. What you see outside is the yog-maya, which catches everybody, which veils everybody through ignorance. But it is also His maya. His maya also catches Him. And His maya is Radharani – He can´t escape Her. He can´t escape because Radharani is completely fully in Love. “Bhaja Nitai Gaur”, oh Lord Nitai! How you surrender to Gauranga, how you surrender to Love incarnate? Through the service I am giving. Make also this Love awake inside of us, make us also part of this drama, make us part of this contribution that we can give to this world. That´s what “Bhaja Nitai Gaur” stands for, you know. 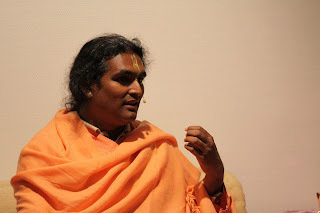 In the Narada Puran, Krishna Himself said to Narad Muni “one can give big lectures, one can talk a lot, one can read a lot, but if they don´t have Love inside their heart, it´s nothing.” So, it´s that what is important. To learn to love God, you know. Not superficial, but real. So, that’s in short that what the mantra stands for. Jai Gurudev!" Forever Together in Your Love!